Arriving at the classroom I was subbing in, I was greeted by this cute little fella. How can you not grin when you look at him!? Sometimes, class does not flow with a substitute teacher as it normally does. Through the years I’ve learned I must be flexible, and I must not get stressed out when things don’t go exactly as planned. Richard Carlson has written a book for teens titled Don’t Sweat the Small Stuff for Teens. I had a chance to skim through it while students were diligently working on projects. Carlson has addressed a wide variety of topics that most teens face, and explains how to keep cool in stressful situations. It’s a quick and easy read which I’d recommend not only for teens. Throughout my day, the cute little flamingo would catch my attention. The way he was propped and the light on his eye gave him a happy relaxed look as if to say, “I don’t have a care in the world.” Funny how this look had a calming affect on me, and encouraged me not to sweat the small stuff. Too often, we let little blunders or uncertainties ruin the moment or day. We stress out rather than remain calm and make adjustments. God wants us to depend on Him, not our own strength. Why else would he give us so many reminders in scripture? When you start to get stressed remember some of these verses to keep your focus on God. 1Peter 5:7 Give all your worries and cares to God, for he cares about you. Psalm 62:8 O my people, trust in him at all times. Pour out your heart to him, for God is our refuge. Psalm 55:22 Give your burdens to the LORD, and he will take care of you. 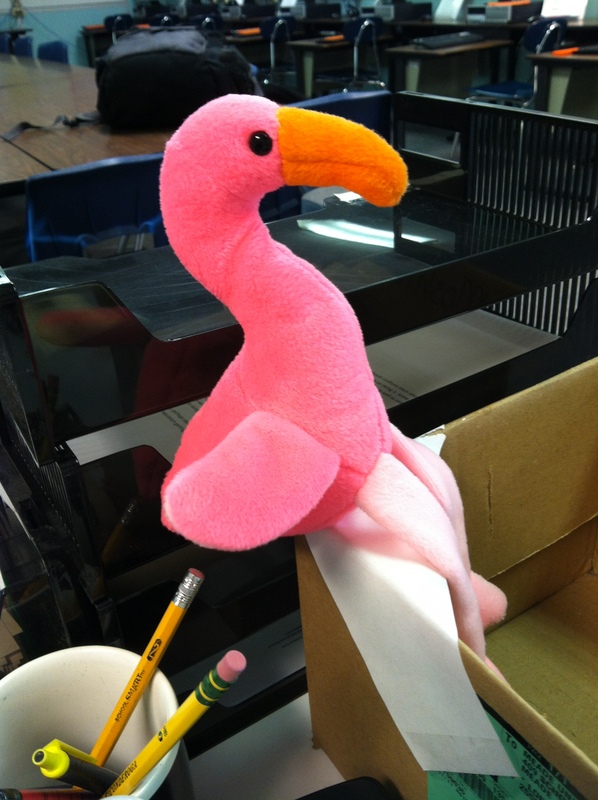 You may not have a cute little flamingo smiling from your desk, but God is with you at all times. He will never leave you or forget about you. Isn’t that reassuring especially in stressful times?